Smart marketers know that honest customer reviews are the best resource for identifying kinks in the current CX and improving future conversion rates. Yet, sadly, seven out of ten marketing teams do not have a clear plan in place to integrate customer reviews into their strategies. Customer reviews really matter. And so does the way these reviews are gathered, analyzed, and applied. This is why customer review management tools are so important. But can they do the job for a marketing team that is looking for the in-depth analysis necessary to make meaningful improvements? Let’s discuss the most important aspects of customer review management. While there are lots and lots of factors that play into Google’s mysterious ranking algorithms, a hefty collection of verified customer reviews can help to improve your standing. According to Google’s Business Support Page, “high-quality, positive reviews from your customers will improve your business’s visibility.” According to a study, customer reviews carry more weight in the ranking algorithms now than they did just a few years ago. As you can see, Google pays close attention to not just the number of reviews, but also how frequently they are updated, whether or not a business responded to them, and how diverse the feedback is. This can be done by plugging your website’s information into Google’s TrustRank filter. Essentially, this is Google’s way of determining whether or not your reviews are trustworthy. Furthermore, if you have a profile on Trustpilot, the review content posted on this platform is viewed as highly credible to the search engines. This is because they have a long-standing partnership with Google to ensure that reviews are up to par. Due to it being an open platform, businesses are not allowed to change, alter, or hide negative feedback, resulting in more credible sentiment for Google to go on. Of course, keywords are also an important factor for SEO, so the TrustBox widget on this platform can also provide more content for organic search results. TrustBoxes can be added into your website to display top reviews and overall star rankings. This, in turn, can eventually qualify you for Rich Snippet Stars. However, Google’s guidelines for this feature are very strict and no guarantees can be made. A fake review can be just as damaging as a negative one. These can easily compromise a customer’s trust with your business. BrightLocal’s Consumer Review study found that nearly 80% of consumers have spotted a fake review within the past year - which made them extremely skeptical about the authenticity of the brand. However, a combined total of 86% of customers admit that it can be difficult to spot sometimes, and therefore, they are not sure how to determine the validity of business feedback. Of course, a plethora - or even just a few - fake reviews not only hurt your business’s reputation, but it can also hurt your search engine rankings. Again, Google is extremely concerned with the validity of business reviews, and they will take fake feedback into account when ranking your business on the SERPS. The smart fraud detection system that Trustpilot uses picks up on fraudulent feedback and spam and automatically deletes it. It compares each review to a long list of behavioral parameters that signal whether or not it is authentic, including IP addresses, language patterns, and how recently the purchase was made. Furthermore, the platform has a zero-tolerance policy for any businesses found to ask or pay for fake positive feedback and they will terminate contracts for this reason. Although businesses cannot remove reviews themselves, they can report ones that they believe may be spam or not up to standards, and the compliance team will do a manual review. To reiterate, customer reviews are one of the best and most authentic forms of insight that can be used to gauge brand sentiment. That said, a smart analytics platform is needed to provide the most actionable information. Trustpilot’s Overview page of this system is extremely helpful for marketers who want a more data-driven approach to customer review integration. By selecting the Analysis page on the main dashboard, you can see the overall sentiment and datasets from your customer feedback. This includes details like the most common collection method and even the best performing tags for prompting reviews. 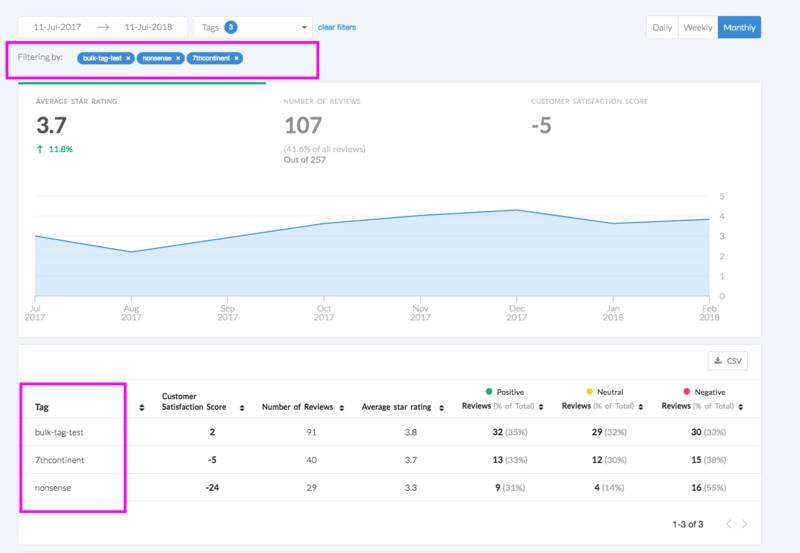 The tool’s tagging feature is really beneficial for segmenting reviews to highlight patterns and track sentiment changes. These tags can be various keywords that your team deems important, such as a specific product or an aspect of your business like customer service. These tags are then tracked and their data is plugged into an analytical report for tracking and research. This approach to review analytics has been proven to boost the customer experience according to a recent study conducted by MITSloan Management Review. This report found that companies who used analytical software had a significant advantage that lead to a 25% lift in customer engagement and a higher level of customer satisfaction when the review data was gathered and applied properly. Gathering a library of verified reviews from customers is not always easy. Not every consumer is willing to take the time to leave their feedback on their own, but they may be more willing to if the business asks them for it. According to BrightLocal’s report, when companies send out review invitations, over half of customers will leave feedback. Using the Business Generated Links feature on this program can increase the amount of feedback you receive, while also ensuring that the reviews come from real, verified customers. Your company can send out service and product review invitations via email once a purchase is completed. These customizable emails include an embedded link that send customers to a review form that can be posted on your business’s website, TrustBox, and social media pages. The Business Generated Links feature is a way to invite customers with a very high level of security. The entire process is encrypted with 256-AES encryption to guarantee a secure transfer of personal data across the internet. 256-bit encryption is approved by the NSA and is used by the US government to transfer data. This makes Business Generated Links ideal for brands in data-sensitive areas like finance, banking, pharma, and healthcare. Overall, customer review management includes a lot of variables that can give your marketing team a strong foundation on which to build a better CX. Each feature deals with the most important factors of the customer review process - from gathering authentic feedback, eliminating spam, and supporting a strong SEO strategy. Some features may be more important to one team than another, so always be sure to do your own research to determine how exactly customer review management fits in to your business strategy.